Craig Police Department members, from left, Sergeant Corey Wagner, Officer Mike Edwards and Officer Lance Eldridge were named Officers of the Year by the Colorado Law Enforcement Officers Association Friday for pulling a Craig resident from his burning house in February. The man, Patrick Hunter, later died from injuries sustained in the fire, but Hunter’s children both said the officers were deserving recipients. When Craig Police Department officer Mike Edwards knocked on the door of a burning house on the night of Feb. 7, he didn’t expect anyone to answer. “People were saying, ‘There’s nobody in there,’ but for some reason, with a car parked in the driveway, I didn’t know if there was anybody in the house,” said Edwards, a 10-year police veteran. The man inside the house, 75-year-old Patrick Hunter, was trying to escape from a fire that was engulfing his home at 1912 Woodlawn, a fire that claimed the life of his ex-wife and live-in companion, Ursula Hunter. Believing he saw Patrick’s hand near the door, Edwards quickly conferred with Officer Lance Eldridge and Sergeant Corey Wagner, both of whom arrived on the scene seconds after him, before entering the burning building and pulling Patrick to the doorway. The other two officers then moved him outside where he could receive medical attention. He was taken to The Memorial Hospital, where he died three days later. 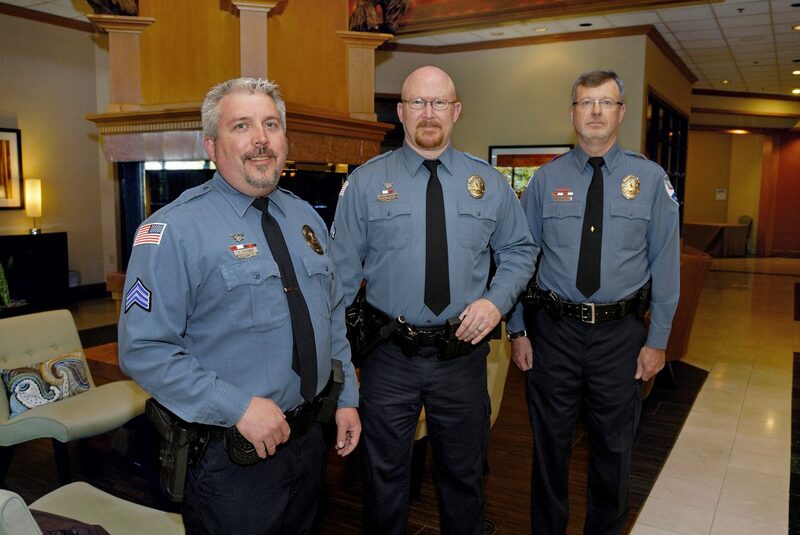 In recognition of their bravery, the three law enforcement officers were named Officers of the Year on Friday by the Colorado Law Enforcement Officers Association. Given annually, winners of the award are chosen from nominations submitted from all over Colorado. “I’m extremely proud of them,” Craig Police Chief Walt Vanatta said. “They made a decision to try to save someone. I would hope I would have had the same courage to make that decision. While the recognition is humbling, Eldridge, who has been a member of the Craig Police Department for 3 1/2 years, said it is also bittersweet. Wagner and Edwards echoed that sentiment. “I wish the outcome could have been different,” said Wagner, a 20-year member of the department. “It’s really nice to be recognized for what we do, but it’s unfortunate … that something bad has to happen in order for officers to get recognized,” Edwards added. Though losing their father was painful, Patrick’s daughter said she doesn’t think it tarnishes the courage the three officers displayed by risking their own lives to try and save someone else. Despite the outcome, Warrington said many positive things resulted from her father being pulled from the fire, most notably that it allowed Warrington and her son, whose middle name is Patrick after his grandfather, to spend time with him when he was in the hospital. Although he couldn’t talk, she said he was responsive and was even sitting up at one point. When it became apparent that Patrick, who had survived two bouts of inoperable lung cancer, wouldn’t be able to recover from smoke inhalation incurred during the fire, Warrington said she and her brother, Hayden resident Sean Hunter, were able to give their father a respectful final farewell and make his last hours as comfortable as possible. “I think they’re definitely worthy of the award,” said Sean, 41. “They did everything they could do. I know they’re trained to not go into a house that’s on fire, and I appreciate the fact that they did. While officers are told not to go into burning buildings, Edwards said this was a “fluke” situation in which circumstances allowed for more officer discretion than usual. Eldridge said if he had to do it over again, he wouldn’t change anything about the decisions he and the other two officers made. Wagner concurred, adding that although receiving the award is an honor, he’s not sure it’s one he deserves. Edwards said he knows if circumstances had been different either of the other two officers would have done exactly what he did. Vanatta, too, thinks the award is an acknowledgment of the actions of all three officers involved as well as of the values displayed by the department as a whole.